What Is The Best Time To Hunt Squirrel? With over 200 different species, squirrels are one of the most familiar rodents located all over the world. They belong to the same family as prairie dogs, chipmunks, and marmots. The most commonly recognized species is likely the tree squirrel, which makes it's home in the trees. However, ground squirrels are also common, living in burrow or tunnels. While it varies slightly between species, squirrel's diets typically consist of nuts, leaves, roots, seeds, berries, and other plants. Some squirrels eat small insects and even baby birds. However, being fairly low on the food chain themselves, squirrels must always be vigilant to protect themselves from predators. Location: Squirrels live on almost every continent with the exception of Australia and Antarctica. Tree squirrels typically live in wooded areas, while ground squirrels live in burrows underground. Generally speaking, squirrels will live anywhere where there is plentiful food and shelter from the threat of predators. Solunar Calendar: Unlike larger animals, a full moon minimizes the movement of small animals like squirrels. Because they can be easily spotted by predators during full moons, squirrel activity tends to decrease during times when the moon is larger in the sky. Time of Year: The best time of year to hunt for squirrels is during the fall months when they are foraging for food. Squirrel movement decreases significantly in the winter months, with some squirrel species even hibernating during this time. Spring is also a busy time of year for squirrels as the come out of their dens in search of food. Time of Day: Squirrels are typically active all day, especially during the fall and spring months when they are more actively in search of food. However, as with most animals, your best chances to hunt are during the hours of dawn and dusk. Temperature: As temperatures begin to drop in late fall, squirrel activity increases greatly as they search for food to store for the winter. Their activity then decreases in the cold winter months as they live off the supply of their fall forage. Barometric Pressure: Squirrels can sense the change in barometric pressure and their activity increases at the sense of an oncoming front. Drops in the barometric pressure will send squirrels on a feeding spree. General Weather Conditions: Squirrels, much like us, enjoy bright calm sunny days. Dry days are also ideal for hunting as squirrels can be easily heard in the woods rustling through the brush and leaves. Rainy days can also be good for squirrel hunting, but the stronger the rain and wind, the more likely the squirrels are to seek shelter. Wind: Wind is another important factor to consider when hunting squirrels. 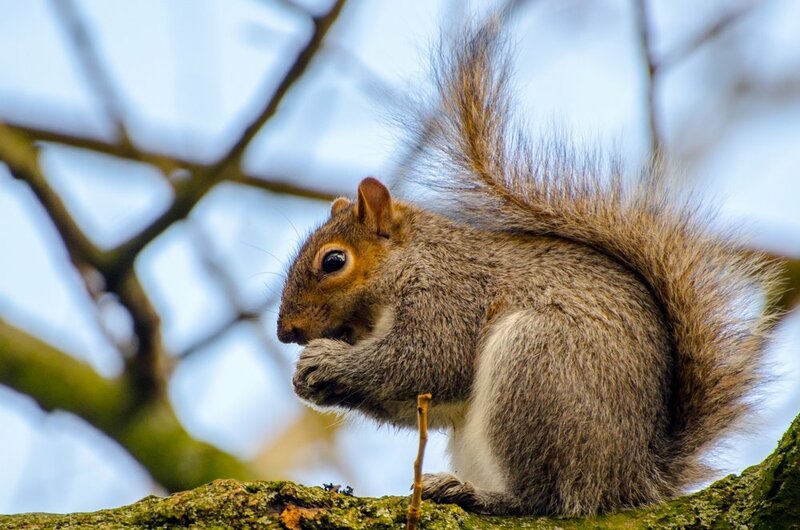 While a little wind won't affect their behavior much, strong winds can make hunting squirrels difficult as they are less likely to come out of the safety of their dens, and if they do, they harder to hear moving about. Want To Find The Best Hunting Times For Squirrel?